This might be my favorite use for construction paper of all time! 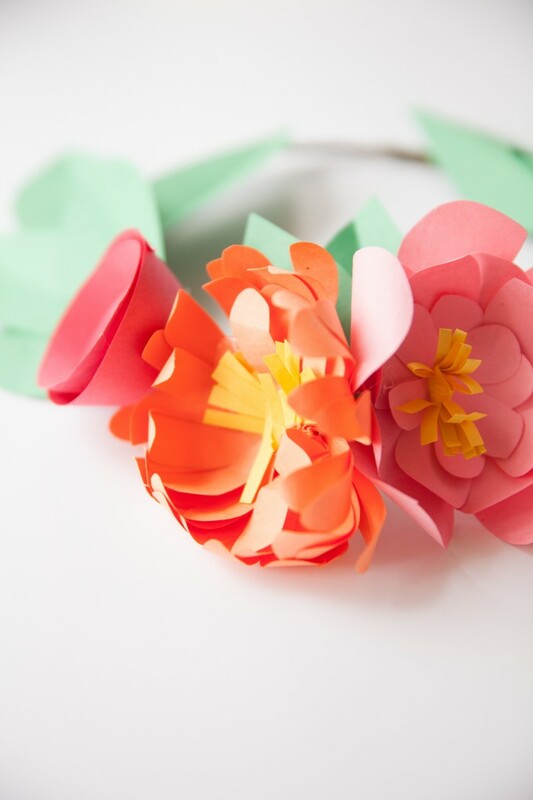 You’re going to love this paper crown tutorial. 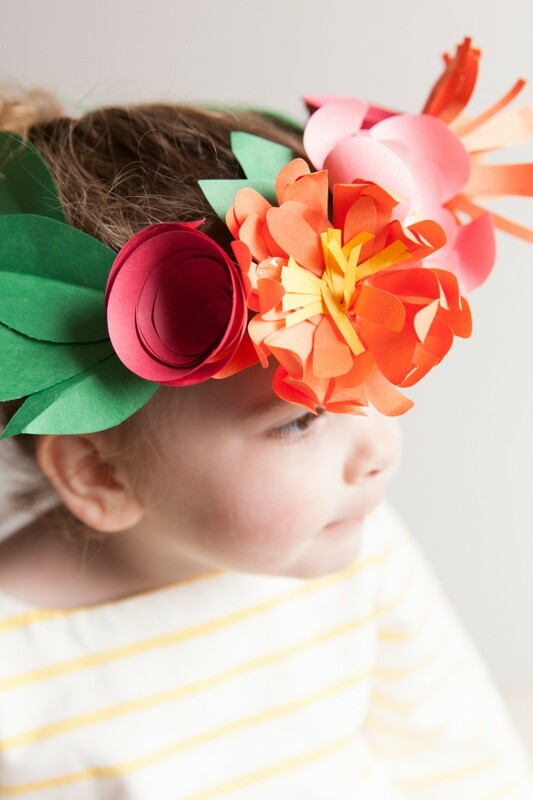 Every good spring party needs an abundance of flowers – and this paper flower crown is about as easy as it gets. Made from regular ol’ construction paper, some floral wire and glue. 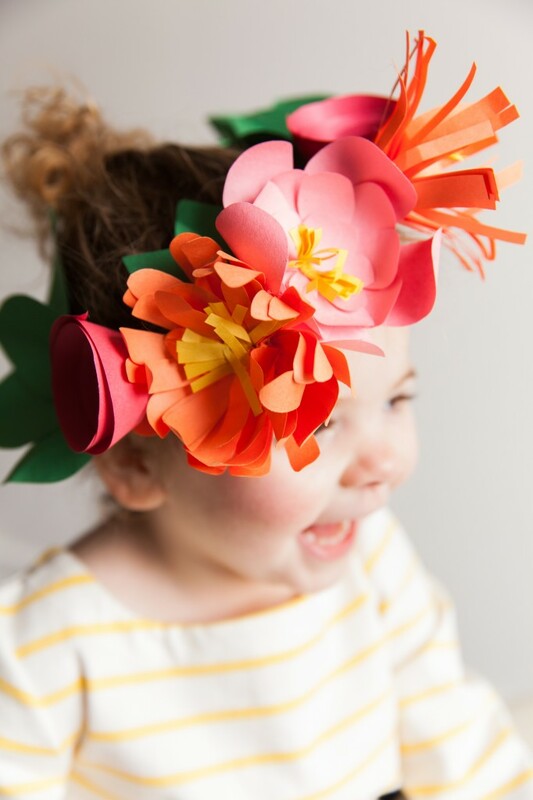 I used to make these flowers with my classroom kiddos as a way to keep their fingers busy when we were listening to a story being read and I know that if fidgety elementary school kiddos can construct them – so can you! 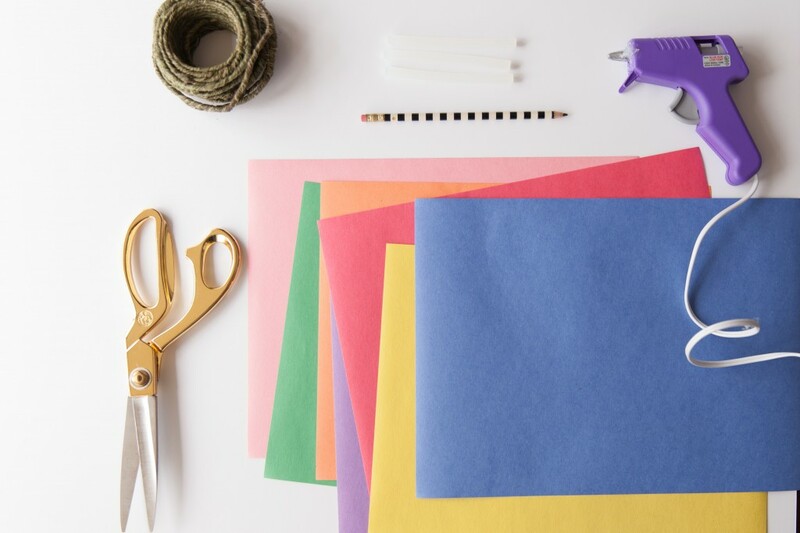 You’ll need a pencil, scissors, glue (I prefer low heat hot glue), construction paper and wrapped floral wire (pipe cleaners and yarn wrapped wire hanger also work, too). 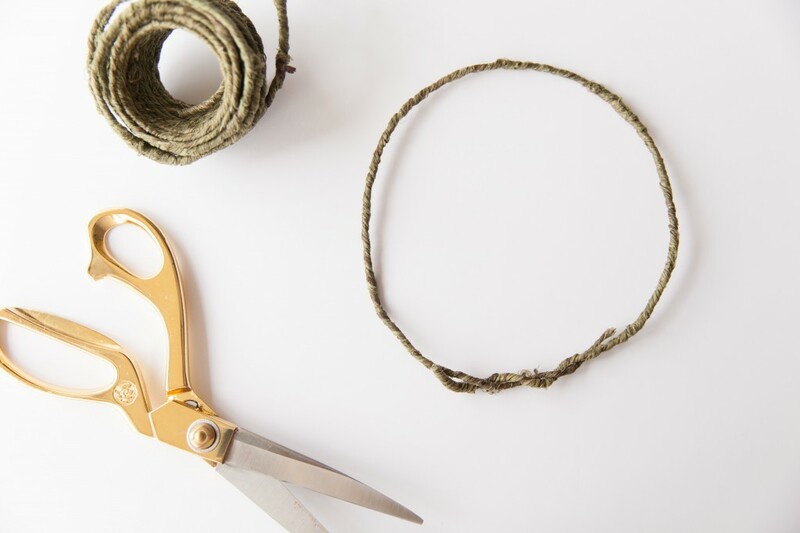 Cut your floral wire to size, leaving a few inches of overhang, and twist together creating the base of the crown. The flower construction is basic and primitive and open to interpretation! I’ll show you four of my favorites – a rose, a mum, a peony and a tassel-ly flower that is fringy and fabulous. The peony starts with a basic five petal flower – feel free to add more petals – but five will do perfectly. YOu can free hand draw them or just start cutting. The largest flower will become the base. Create about 3 more 5 petal flowers in a medium size and two in a smaller size. (My smallest flowers only have 4 petals. Yours can too. It’s ok.) Use the pencil to gently roll each of the petals towards the center of the flower, making them curl. Do this for all the individual flowers. Then stack them together, securing with a dot of glue. The mum starts off looking more like a daisy. I like to make these 4 layers at a time by folding the paper in fourths and drawing and cutting just once. Roll the petals of the flowers varying the ‘tightness’ of the rolling so that the outside petals are more relaxed and the inside petals are tighter. 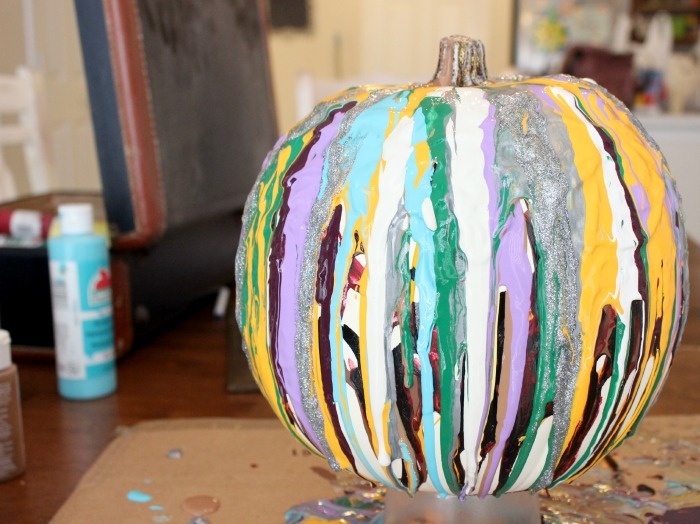 Secure the layers with a dot of glue between each. I find the roses to be the trickiest but they are also the least labor intensive! 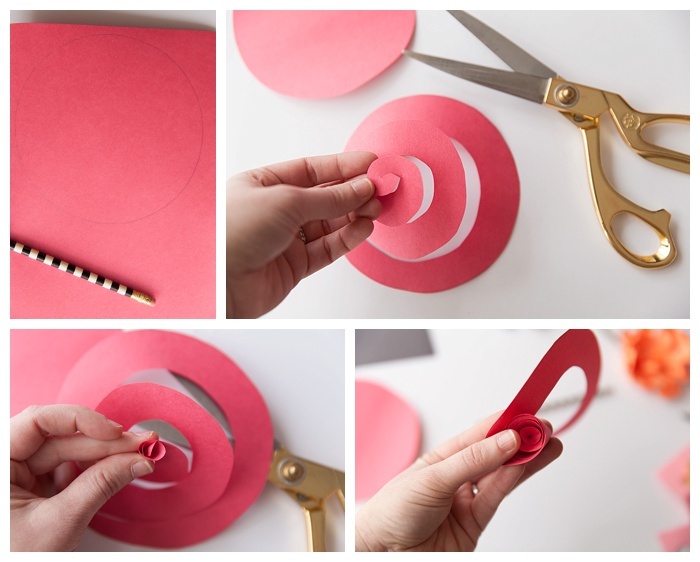 Start by tracing a circle on the construction paper. Cut it out and then cut it into a spiral. Pinch the center and start rolling the paper onto itself creating a rose shape. Secure with glue as you go to help keep the rose in shape. 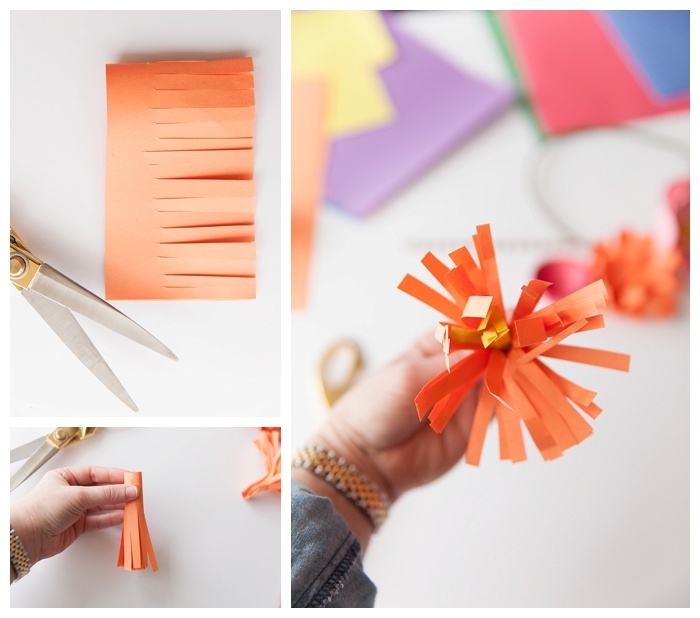 To make the tassel flowers, cut a piece of construction paper in half, lengthwise. 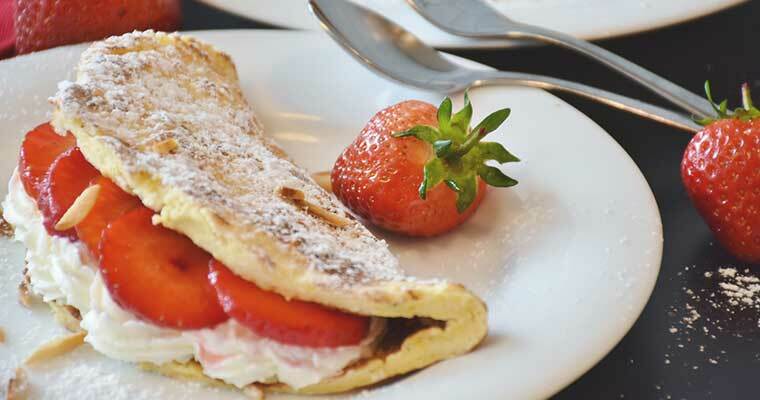 Fold it in half on the long side and fringe the paper leaving about an inch of buffer. Roll the paper into a tassel, secure with glue, and while holding onto the non tasseled end, gently push the flower onto a flat surface (the table or your hand) and push the petals out. 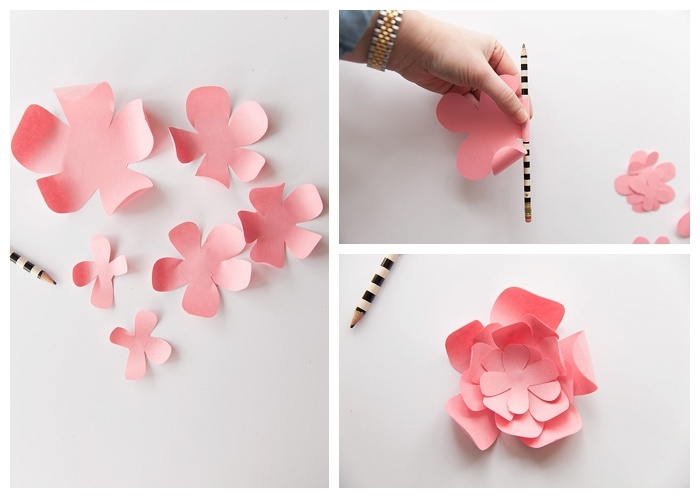 Create the center of the flower the same way in a contrasting and smaller piece of construction paper. Then lightly roll the petals away from the center. 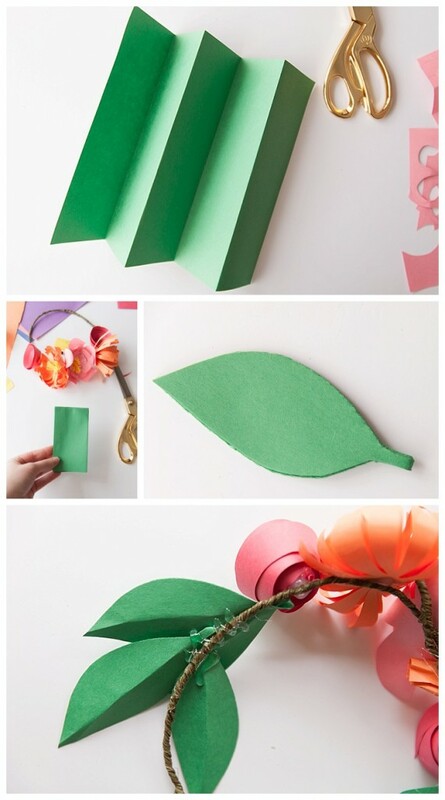 To make a simple leaf, accordion fold green construction paper then fold in half. Draw and cut or free hand a leaf shape with the base of the leaf touching the folded edge – this way two leaves remain attached making it easier to glue them onto the crown. Crease with your finger nail and shape by gently folding and bending. Then attach among your flowers! One of the reasons I prefer attaching the flowers with hot glue is because it cools fast and hold well and I can see exactly where I’ll need more as I’m going. It also acts like a non-slip gripper when the crown is on, helping it stay on your head! There is no right or wrong color choice, pattern or placement – do what looks right to you. I might be making another one with just peonies on it for me! 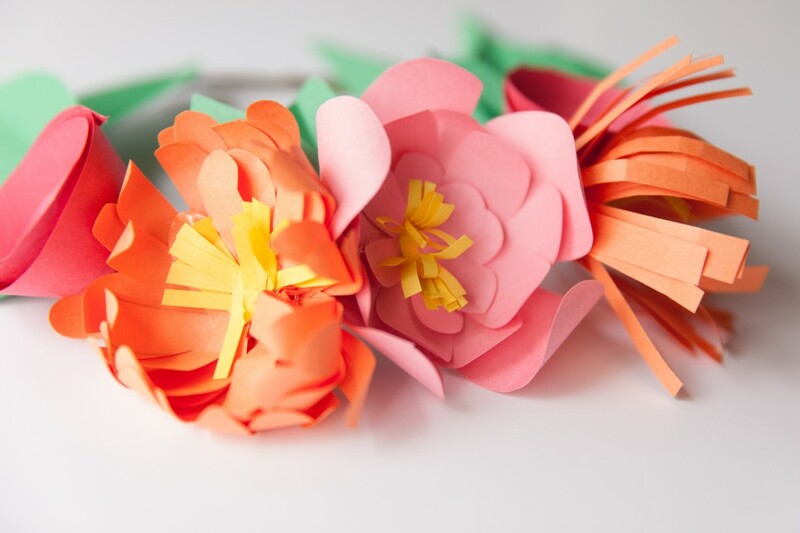 Paper flower crows are inexpensive to make, beautiful and don’t wilt like real flowers – so you could make a handful weeks before hosting a spring party. Can you imagine greeting everyone with a flower crown? Sounds like a dream spring party! If you loved this post, don’t miss Amanda’s Paper Airplane Baby Shower, Painted Wood Bead Necklace, or DIY Story Stones!